These gorgeous Forever Brilliant stud earrings showcase 7.0mm square brilliant cut moissanite gemstones. Beautifully crafted in rhodium plated 14K white gold and secured in a four prong setting. Each 7.0mm moissanite gemstone has a Diamond Equivalent Weight (DEW) of 2.10ct (Actual Weight 1.88ct). The pair of earrings has a total Diamond Equivalent Weight (DEW) of 4.20cttw (Actual Weight 3.76cttw). 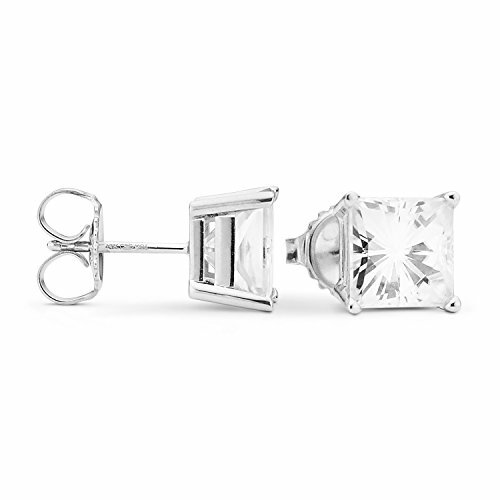 These gorgeous Forever Brilliant stud earrings showcase 7.0mm square brilliant cut moissanite gemstones.